The Conquest search query shown (with no disorder, no errors and R < 0.1 also specified). 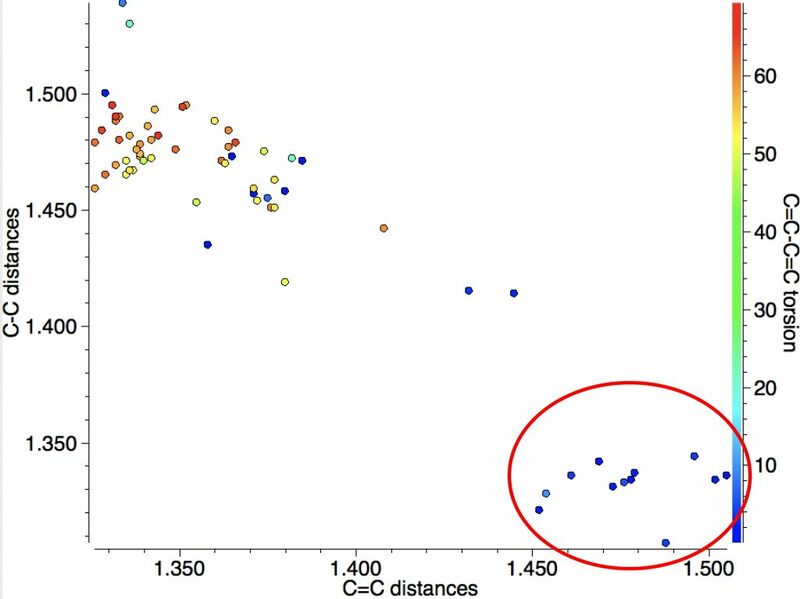 There are 23 instances (February 2017 database; see DOI: 10.14469/hpc/2231 for search query) of the supposedly unstable cyclobutadiene motif! The three clusters deserve explanations. The orange cluster reveals a long C-C bond (rather longer than normal C-C bonds), accompanied by short C=C bonds, as indicated by the valence bond form shown below. Take particular note that the arrow connecting the two forms is NOT a resonance arrow but an equilibrium arrow. The “bond shifting” is not fast but slow, allowing long and short bonds to be measured in a crystal structure. 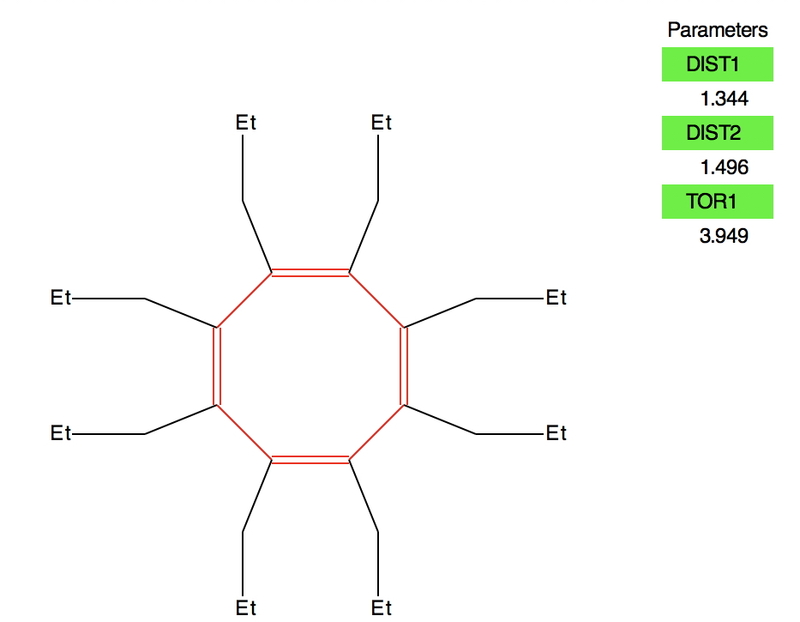 The Conquest search query is shown (with no disorder, no errors and R < 0.1 specified) for the 8-ring, which further specifies a torsion angle about a C-C bond to determine how planar the ring might be. 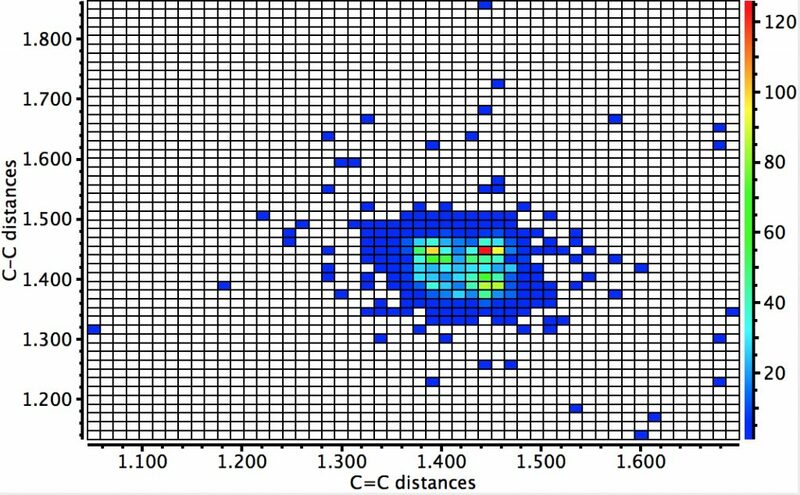 The “normal” cluster in the top left exhibits long C-C bonds and short C=C bonds. The colour code indicates how planar the ring is (red-blue spectrum = twisted ⇒ planar). 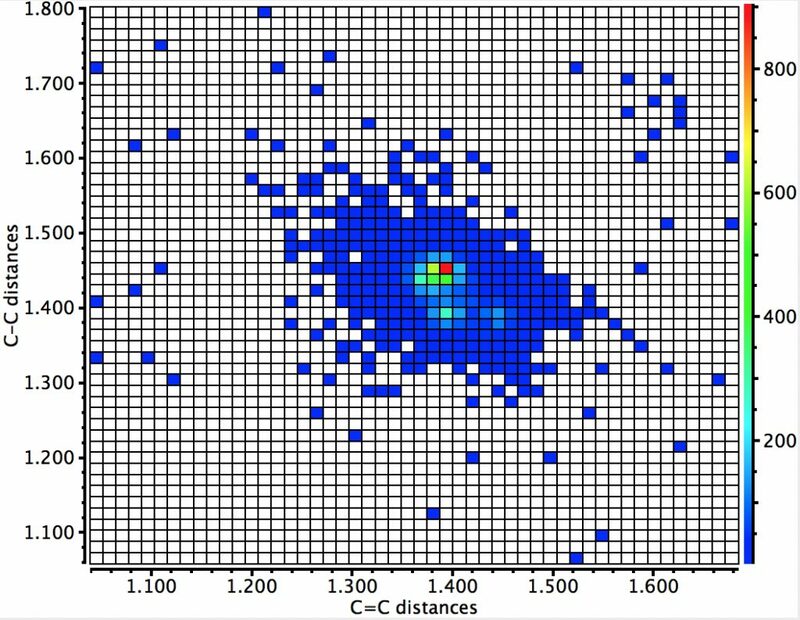 The majority of examples are twisted about the C-C bond(s), but there are a few interesting examples that are not, as shown by the blue dots. There are only a few “bond-equalised” examples in the centre; perhaps “push-pull” induced equalisation is more difficult or perhaps few examples have been made? 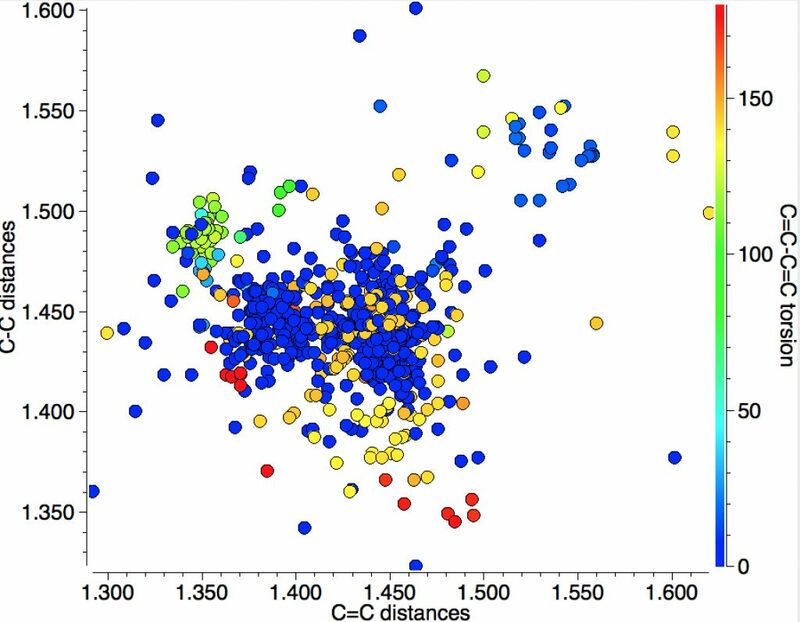 The members of the red cluster in the bottom right all reveal short “C-C” bonds and long “C=C” bonds. Intriguingly they all also have low values of the torsion about one C-C bond (although not always about all four C-C bonds). A typical example (BAQVUK, DOI: 10.5517/CC4GWWB ) is shown below. These all need careful inspection and possibly reversal of the C-C and C=C indexing. It was interesting to discover how many crystalline examples of this archetypal “unstable” cyclobutadiene motif have been made, and the means by which some of them at least have been stabilized. In the more abundant cyclo-octatetraene system, I learnt that one has to be cautious about blindly accepting the bond order designations in the database. Perhaps we might learn here that some of these have indeed been re-assigned in the next release of the database. This entry was posted on Sunday, March 5th, 2017 at 9:07 am and is filed under crystal_structure_mining. You can follow any responses to this entry through the RSS 2.0 feed. You can leave a response, or trackback from your own site. 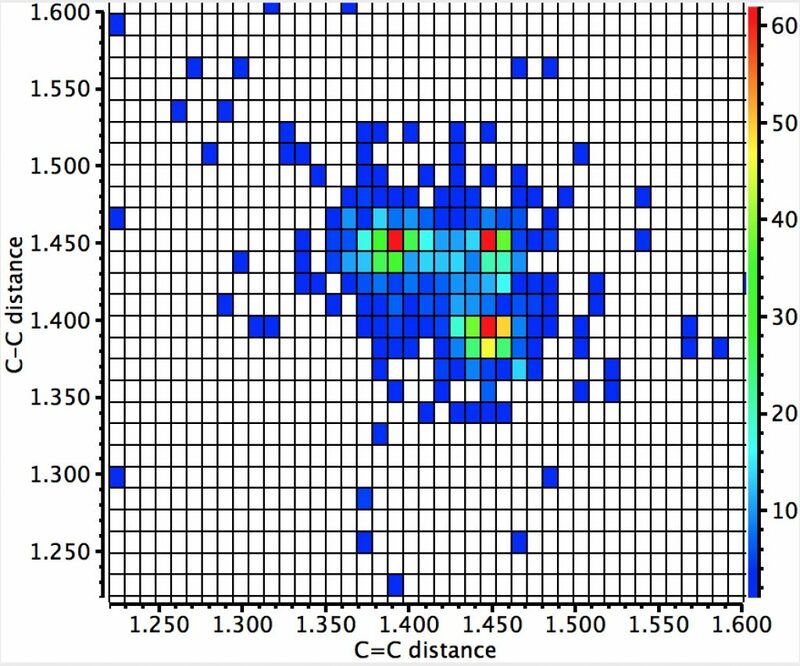 Here are plots of  annulenes as an extension of the  and  systems reported above. Most of the structures are embedded in a larger molecule such as a fullerene, so it’s not quite equivalent to the previous searches. 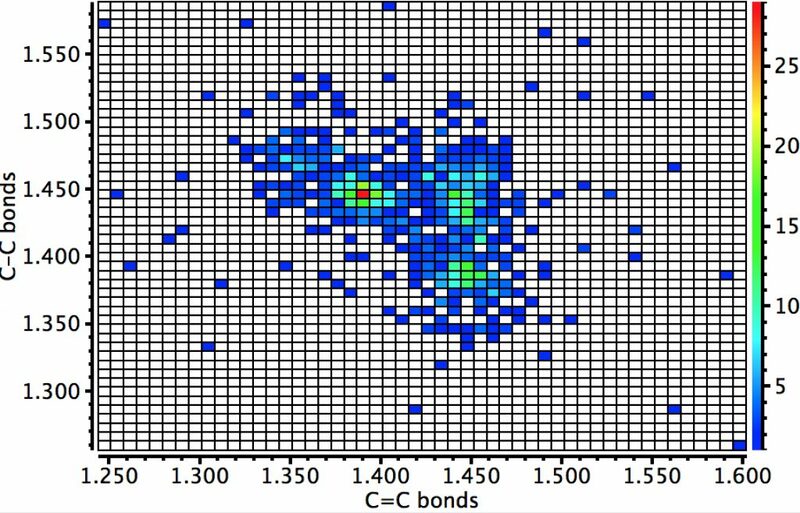 Note again one hotspot where the C-C bond (nominally the longer bond) really is longer than the C=C bond. There is a second hotspot where the two are equal, but signs of a third hotspot where the C-C bond is now shorter than the C=C bond. In such systems of course, the nominal valence bond structure shown (and indexed by CCDC) is just one of often many possibilities. Again however one can pose the question whether some of these assignments might be improved by transposing the C-C and C=C representations by cyclic bond shifting. Two more searches, respectively  and  annulenes. The first is associated with “aromaticity” and hence propensity to delocalize. The second with “anti-aromaticity” and hence bond localisation. 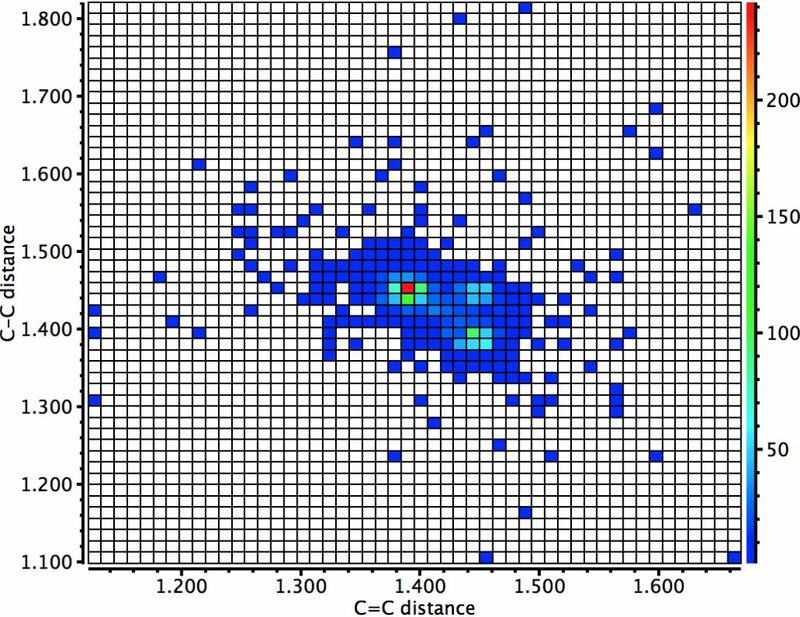 The first appears to have signs of three hotspots but they are very indistinctly separated and we might conclude there is just one, with bond lengths more or less equal. 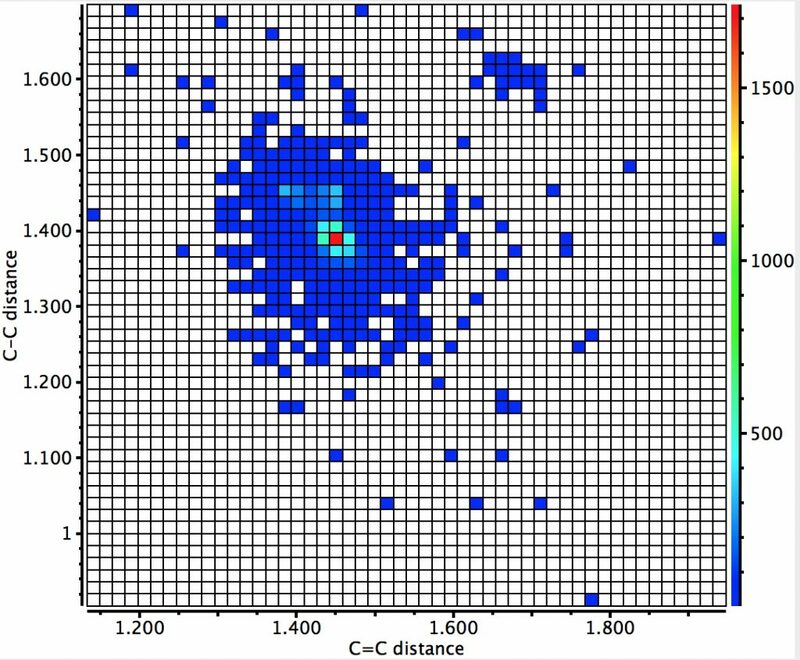 The second has just two more obvious hotspots, the one with the greatest number of examples having the C-C longer than the C=C and the second being the inverse. There is a faint third spot where the two lengths are equal. It is certainly true that the  annulene distribution is far more circular than either the  or . That of itself is an interesting “experimental” illustration of the famous Hückel 4n+2 rule. Well, I might as well add to the annulenes, showing results for ,  and . The first seems nonsensical. Surely that is benzene, and its very well established that the bond lengths do not alternate! But, a search query for benzene drawn as a cyclohexatriene, with alternating single and double bonds does not necessarily return benzenes. 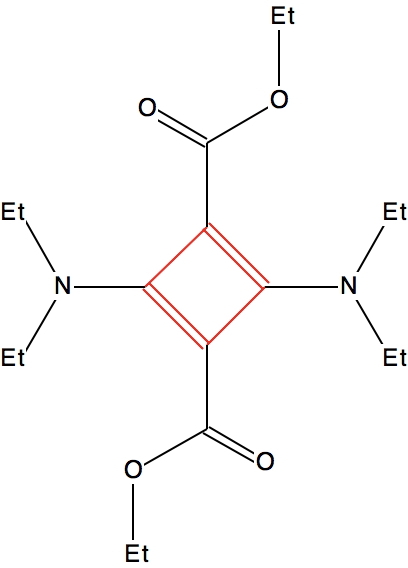 That is because these are indexed in the CSD as having a different bond type, either delocalised or aromatic. Most of the instances found using the cyclohexatriene motif are such sub-structures embedded in fullerenes and other similar systems. 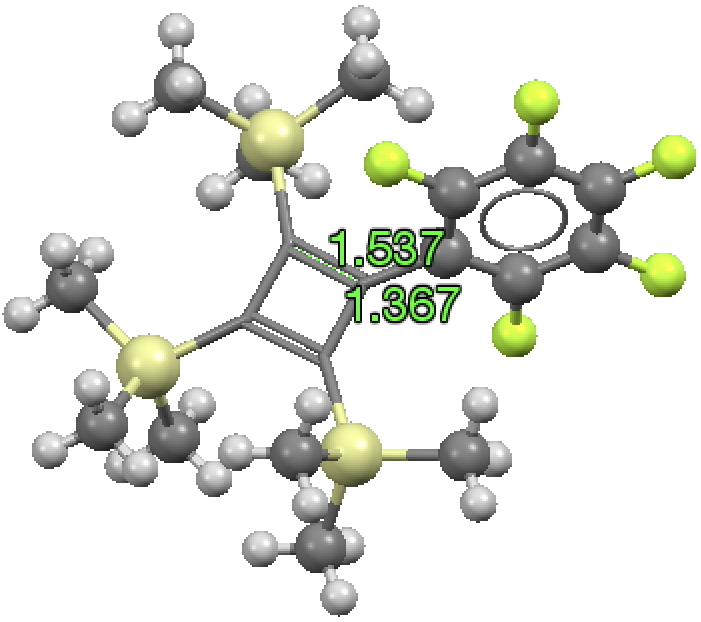 Nonetheless,  annulenes do seem to have just oe prominent hotspot, centered at lengths of ~ 1.4Å and 1.45Å. 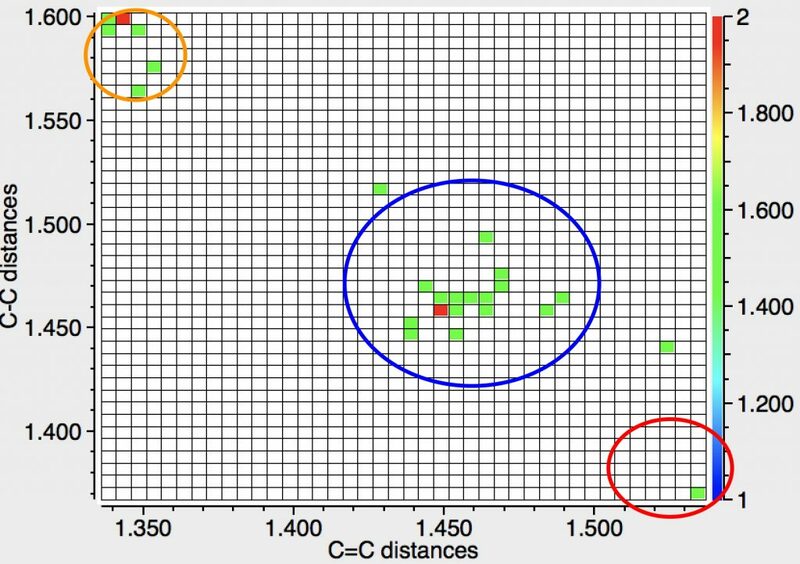 shows a very strong three-cluster motif; C-C longer then C=C, equal and C-C shorter then C=C. One again asks if the latter cluster might be removed by bond shifting the assignments, and whether such a shift would make sense in the context of the larger structure in which the  ring is embedded. shows a surprise. The distribution is very circular, with just one hot spot at about 1.40 and 1.44Å. I am not sure what to make of that! I notified CCDC of the above results and their senior scientific editor got back to me with the following response. I have been through the lists of cyclobutadienes and cyclo-octatetraenes and have hopefully corrected all the cases with mis-assigned bonds. We hope that as a result of changes in our software that this should be less of a problem these days than it clearly has been historically. Which means that if you perform the searches above when the next release comes, you should get rather different results. 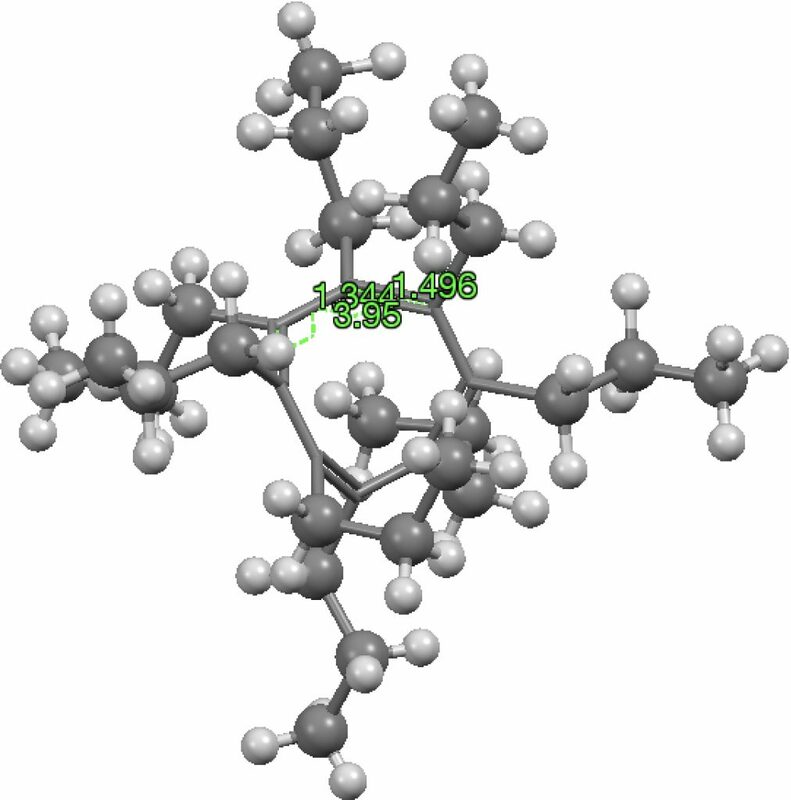 Stable “unstable” molecules: a crystallographic survey of cyclobutadienes and cyclo-octatetraenes. is licensed by Henry Rzepa under a Creative Commons Attribution-Noncommercial-Share Alike 3.0 United States License.